As the deadlock in our national government becomes more and more entrenched, it is important, now more than ever, that voters favor leaders who have demonstrated a rigorous dedication to solving our country’s problems. In the Senate, this need is especially dire, which is why we feel compelled to endorse Elizabeth Warren’s bid for the Massachusetts seat. 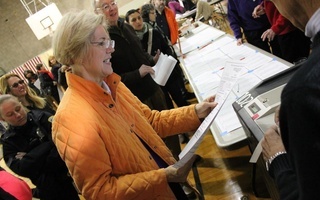 Elizabeth Warren has exhibited a dedication to the wellbeing of her fellow Americans that, on its own, should be reason enough for her receiving our endorsement for Massachusetts’ Senate seat. Given our economy’s lethargic recovery rate, however, we must also point out our overriding concern during this year’s election; namely, that a vote for a Republican is a vote against a healthy economy. Elizabeth Warren’s background overseeing the Troubled Assets Relief Program and helping to create the Consumer Financial Protection Bureau speaks to her expertise in wrestling with tough issues of economic stimulus and regulation in order to improve the lives of Americans. Our economy is still hurting from the consequences of that lack of regulation—and a close analysis by the Economic Policy Institute reveals that more than a full percentage point in unemployment could have been mitigated had our Congress provided more aid to state and local governments during the recovery. Such aid was a crucial part of the 2009 stimulus, and was part of many bills put forth by President Obama, including the $450 billion jobs bill proposed in 2011. The Republicans—including Senator Scott Brown—stifled these proposals. Ultimately, our endorsement comes from considering more than just Warren’s uniquely well-suited qualifications for the job of being a Senator. Senator Scott Brown is extremely likeable, and his sincere attempts at bipartisanship are admirable. However, as long as he and other Republicans insist on voting against the aid our economy needs, they do not deserve our votes. Last-minute news that Harvard Law School Professor Elizabeth Warren will not be teaching “Contracts” this fall is fueling speculation that the consumer rights advocate will be tapped to head the Bureau of Consumer Financial Protection. Harvard Law School Professor Elizabeth Warren’s meeting with President Obama last week increased speculation as to whether she will be named head of the Bureau of Consumer Financial Protection, the new agency—created in July—charged with monitoring financial institutions and promoting consumer rights. Therefore, two years into the Wall Street-coddling tenure of sitting Massachusetts Senator Scott P. Brown, whose woes have recently been compounded by fresh allegations of plagiarism on his campaign website, we firmly believe that Warren would be the better steward of the legacy of the late Senator Edward M. Kennedy ’54-’56. In an unprecedented show of support, Harvard employees have combined to donate more than $227,000 to Harvard Law School professor Elizabeth Warren’s campaign for the Massachusetts’s junior U.S. Senate seat since last September, helping to make their colleague the best-financed congressional candidate in the country. With Harvard faculty members showing unprecedented financial and public support for colleague Elizabeth Warren’s campaign for U.S. Senate, Harvard’s staff members have also begun to make their choice in the competitive race between the Law School professor and incumbent Senator Scott Brown. Working in the traditionally liberal bastion of Cambridge, many Harvard staff interviewed for this article—ranging from dining hall workers to security guards—say they stand behind Warren.